Chadden is a Australian wildlife biologist and film maker who has spent a lifetime traveling, studying and filming some of the world's most exotic animals and places. 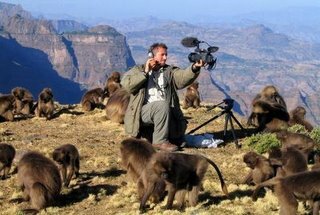 Buoyed by a keen passion for exploration, conservation and education, Chadden is currently a producer/director with the BBC Natural Histroy Unit in Bristol, UK. Since first premiering in July 2005, National Geographic Channel International (NGCI) has broadcast Cliffhangers in all of it’s 164 markets around the world, including Canada, Latin America, Africa, the Middle East, Asia, Australia and New Zealand. It has enjoyed repeated airings in many territories and has received glowing reviews from regional broadcasters and viewers alike. National Geographic considers Cliffhangers to be an unequivocal success and is currently in discussions to distribute the series within other televisions markets. The Gelada, the only grass-eating primates in the world, form the largest groups with one of the most complex social systems of any primate. Living in sub-zero conditions at 14,000 feet, they have made their home on the sleeping cliffs - narrow ledges that drop away 5000 feet to gorges below. These precarious spots, barely wide enough for a single monkey, are essential for the survival, as countless predators prowl the plateau above. With the help of the Gelada buddies he has made over the course of his studies, Chadden explains the complicated etiquette and meaning behind their behavior. He reveals a touch male society where ritualized violence and sudden confrontations are regular occurrences, as the males vie for the affection of the females, who themselves are not as cuddly as they first appear. He also explores the threat of predation, and the strong influences this has had on the behavior of the Gelada. Chadden knows all there is to know about this unusual species, and shows us that, with fights, group takeovers and love affairs commonplace, the Gelada society is easily on par with any human soap opera.